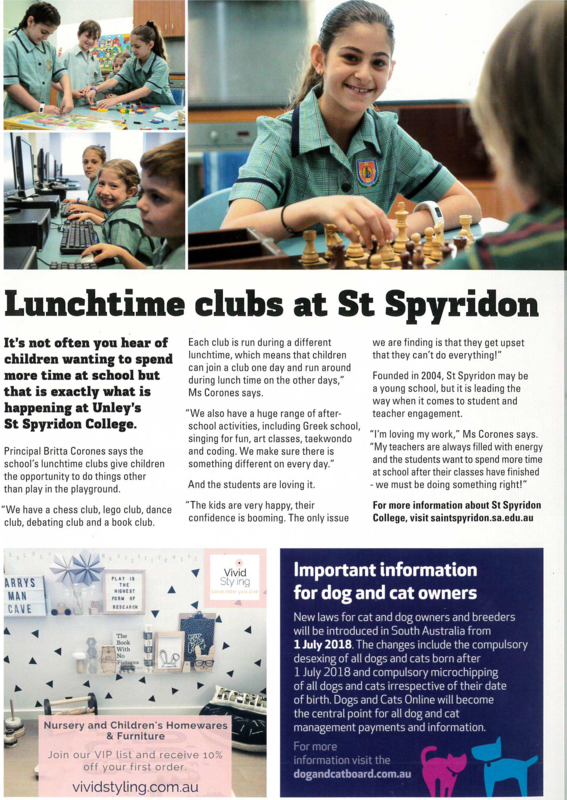 Below is a list of the lunchtime clubs and after school activities that Saint Spyridon College is offering in 2018. Please contact the email address listed to register your child/ren and for more information. All clubs and after school activities begin in week 2 of each term unless otherwise specified. Monday 3.30 – 4.00pm Singing Fun with Miss Sofie – contact [email protected]. Monday 4.00 – 6.00pm Greek School run by Saint Spyridon Parish – contact [email protected] to register interest. Tuesday 3.30 – 4.30pm Kelly Sports – https://www.kellysports.com.au to register and for more information. Wednesday 3.45 – 4.45pm Coding with Ken – contact o[email protected]. Thursday 3.30 – 4.30pm (Terms 1&4) Greek Dancing – contact o[email protected]. **Payment for after school activities needs to be made through the front office, with the exception of Kelly Sports, which should be paid for online through the link provided.